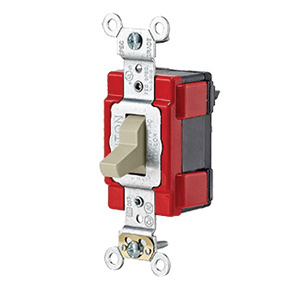 Leviton Lev-Lok® 1-Pole Extra heavy-duty specification grade AC toggle switch has voltage rating of 120/277-Volt AC and current rating of 20-Amps. It withstands dielectric voltage rating of 1500-Volts. Self-grounding switch in ivory color, has impact-resistant PBT base and polycarbonate toggle. The four corner latches securely fastens the switch face to the body. It has solid brass locking pins for secure connection between device and wiring module. It has maximum load capacity of 1 hp at 120-Volts and 2 hp at 240/277-Volts. It measures 1.5-Inch x 1.41-Inch x 4.06-Inch. Tamper-resistant switch operates at temperature range of -40 to 65 deg C. It is UL 94 V2 flammability rated to withstand harsh environmental conditions. 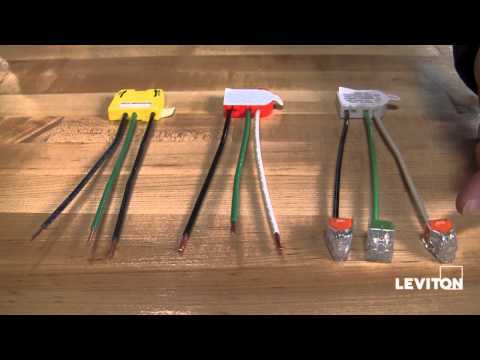 Toggle switch is UL/cULus listed, NOM certified, RoHS compliant and meets ANSI/NEMA standards.